Ubuntu 17.10 "Artful Aardvark" finally released at today Thursday, 19 October 2017. This 2017's latest version of Ubuntu really brings the biggest change in its user interface: switch from Unity to GNOME 3! And Ubuntu 17.10 doesn't come alone, it released along with all the Ubuntu Official Flavors (Kubuntu, Lubuntu, Xubuntu, etc.). Here I listed direct download links + torrents from all flavors (but remember that the regular Ubuntu no longer ships 32bit ISO anymore). Enjoy! NOTE I: the official Ubuntu now only provides 64bit and no longer provides 32bit. If you want 32bit, I suggest you to download Ubuntu Flavors instead, either it's Kubuntu, Lubuntu, or another one. NOTE II: please help reduce the mass load on the download servers by using torrent links instead of direct links. Or, if you want to cut down your download cost (e.g. only download 30% of 100% size) please use zsync links instead. This article is a list of download links. If you want to install, read installation guide. If you want reviews about Ubuntu 17.10, read our preview series Part 1 until Part 7, or Kubuntu Quick-Look and also our Ubuntu 17.10 beginner's guide Part 1 and Part 2. Official Ubuntu, the newly GNOME-powered desktop. 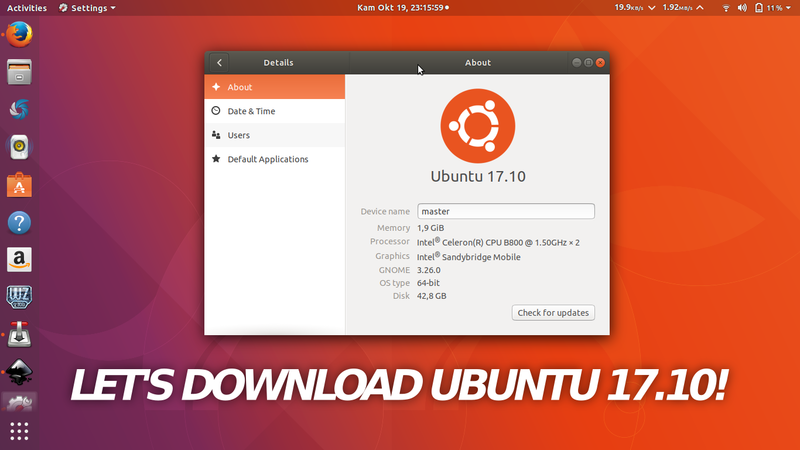 Ubuntu Flavor, using KDE Plasma user interface. Ubuntu Flavor, using LXDE user interface. Ubuntu Flavor, using XFCE user interface. Ubuntu Flavor, using MATE user interface. Ubuntu Flavor, using Budgie user interface. Ubuntu Flavor, specialized for multimedia (graphic design, animation, audio & video) productions. Ubuntu Flavor, specialized for Chinese users. And finally, if you wish to help and contribute to Ubuntu Community, please read https://community.ubuntu.com/contribute.